A quick reminder that this season we’re going to the covering each match day separately (the last few seasons it’s been each round). Making the posts a little shorter and focused on a day. Video Highlights, Goal Updates and more via Twitter, Facebook and Instagram. Of course following just 2 games the league table doesn’t reflect a probable final table, but it does make of nice viewing for a few sides. Jeju and Jeonbuk lead the way with the only perfect records. Seoul follow them on 4 points. Sangju, Pohang, Gangwon, Gwangju and Ulsan all currently have 3 points. Daegu, Incheon and Suwon Bluewings all have just a single points. Finally Jeonnam are bottom and currently pointless. Of course this table doesn’t include Saturday’s games. The first game of the day comes from Ulsan, as they take on Korean Army side Sangju Sangmu. Ulsan Hyundai lost 3-0 last weekend in the league agaisnt Jeju United and then drew in the week to Muangthong United 0-0 in the ACL. Sangju Sangmu are level on points with Ulsan, after losing week one but winning 3-1 last weekend against Jeonnam Dragons. Both sides will be evenly matched coming into this game. Last Time: Ulsan won 2-1 last October. Going agaisnst the odds here and siding with Sangju. Ulsan haven’t looked gelled apart from that game against Brisbane in the ACL. The second game of the day comes from the Suwon “Big Bird” World Cup Stadium. Suwon Bluewings take on Daegu. Suwon have had a rough start to their league season drawing the super match week 1 and then losing last weekend to Jeonbuk 2-0. They did however beat Eastern SC in the ACL 1-0 during the week. Daegu lost their opening game and then last weekend let a 2 goal lead slip to draw against Incheon United 2-2. Last Time: Suwon won 2-0 back in August 2013. This is a game Suwon should win (at least in theory). 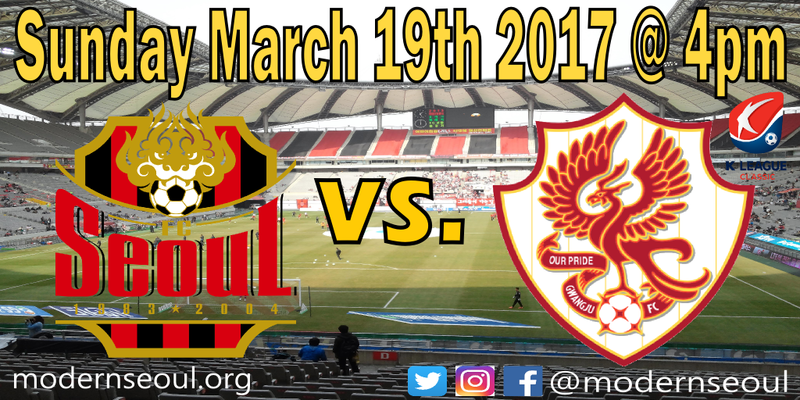 The 4 o’clock kick off and our highlight game of the day comes from the Sangam Stadium (Seoul World Cup Stadium), and features FC Seoul & Gwangju. FC Seoul suffered a 3rd straight ACL defeat during the week, but in the league they’ve looked solid collecting 4 points from their opening 2 games. Gwangju won their opening game but lost last weekend 2-0 away to Pohang Steelers. Last Time: Seoul won 2-1 in October last year. Seoul win start this one as favorites, but their issue recently has been defensively so we see Gwangju scoring at least. 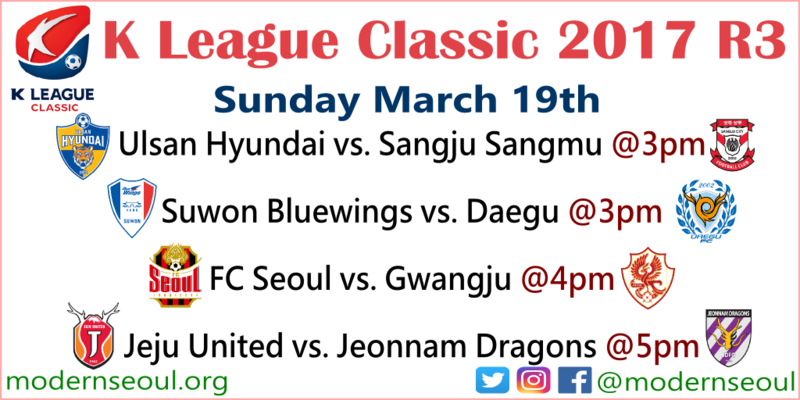 The late afternoon Sunday game comes from the Jeju World Cup Stadium and features Jeju United and Jeonnam Dragons. Jeju United traveled to Australia during the week and picked up a point for their ACL campaign. They’ve had a perfect start to the K League season 2 wins from 2. Jeonnam Dragons on the other hand have had the worst possible start to the season 2 defeats from 2. Last Time: Jeju United won 5-3 last October. Jeju are the moment look very strong, the only possible issue will be tiredness from traveling to Australia and back during the week. 2 Questionable penalties helped Seoul to 3 points this afternoon, Ulsan lost to Sangju, Suwon came back to draw with Daegu and finally Jeju continued their impressive start by beating Jeonnam. 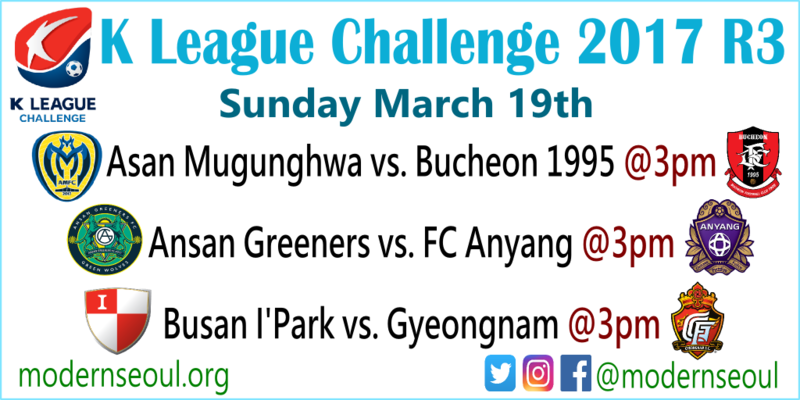 Sunday is also a big day in the K League Challenge as 6 sides continue their 2017 seasons. Only 3 games are at 3 o’clock and between; Asan vs. Bucheon, Ansan vs. Anyang and Busan vs. Gyeongnam. The league table after just a two games has Busan I’Park leading the way, level on points with Suwon FC and Gyeongnam. Three sides sit on 3 points Asan Mugunghwa, Bucheon 1995 and Ansan Greeners. Daejeon Citizen and Seongnam FC both have a single point. Whilst Seoul E-Land and FC Anyang are at the bottom and still without a point so far this season. 2017 Structure Update: This season the number of teams has dropped down to an even 10 sides. 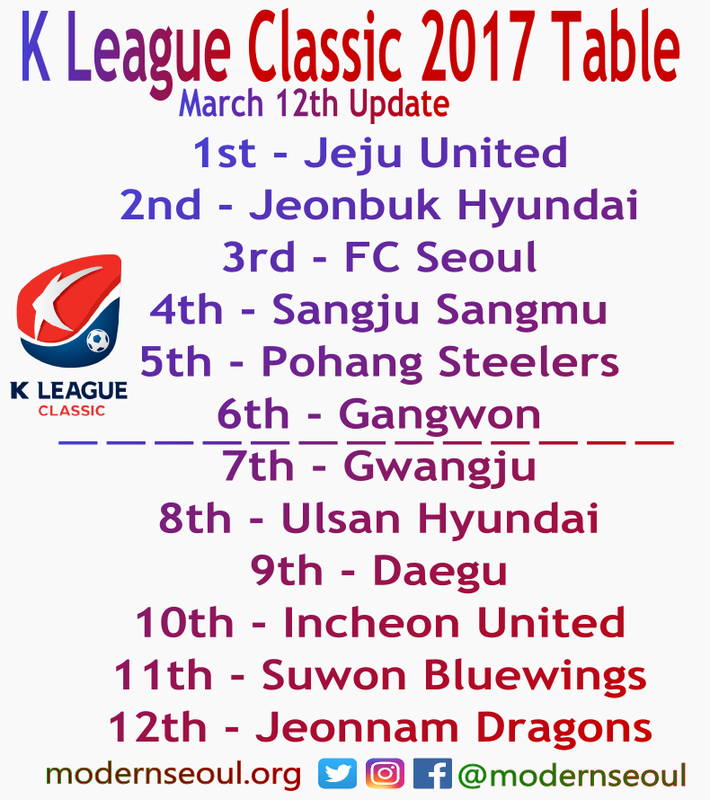 Just like in previous seasons teams will play each other 4 times with the winner gaining automatic promotion to the K League Classic. 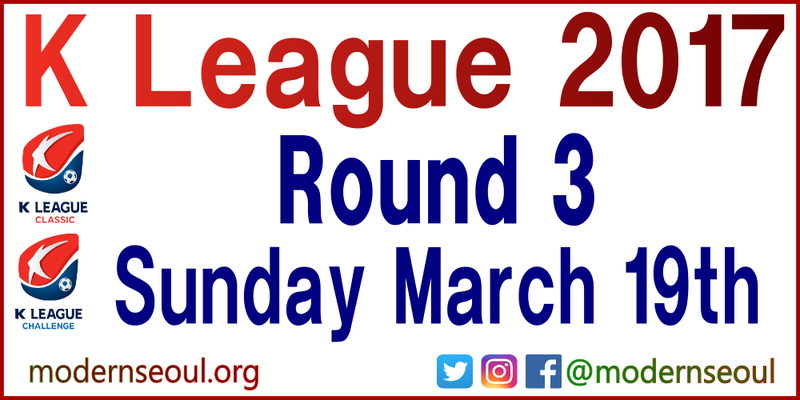 The next 3 sides enter the Promotion playoffs, and finally once again there is no relegation down to the National League. 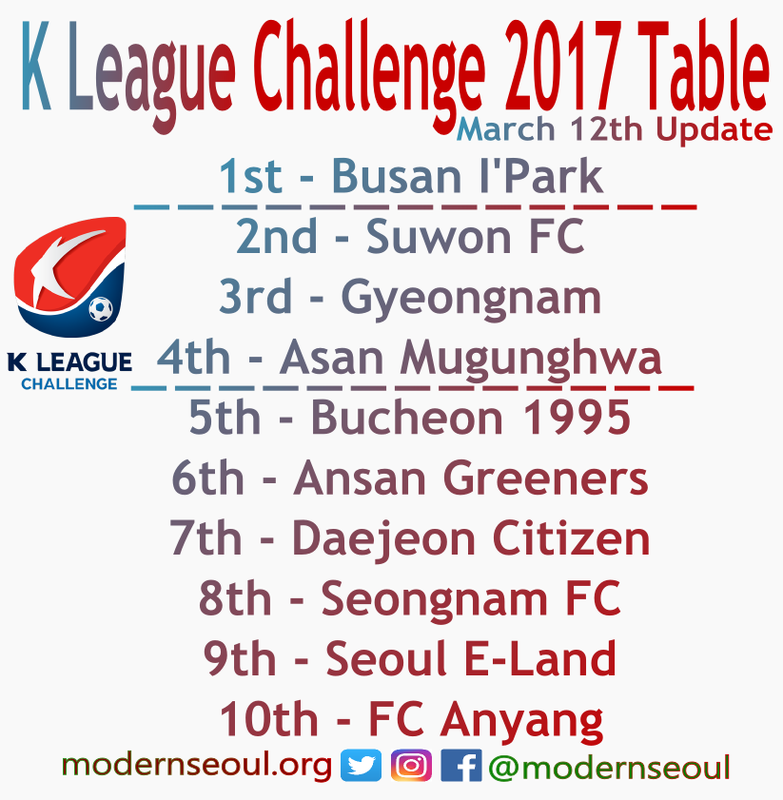 Both Asan Mugunghwa and Bucheon 1995 sit on 3 points around the playoff places. However last weekend Asan looked strong and flowing at home beating Anyang, whilst Bucheon looked incomplete losing to Suwon FC away. Close game on paper, but we’re giving the edge to the home side. The 1st ever Line 4 Derby between Ansan Greeners and FC Anyang. Ansan Greeners won their first game of the season, but fell last weekend to a strong Busan side away. FC Anyang are still pointless this season and have looked poor. Ansan will be slight favorites, but it will be a close game. 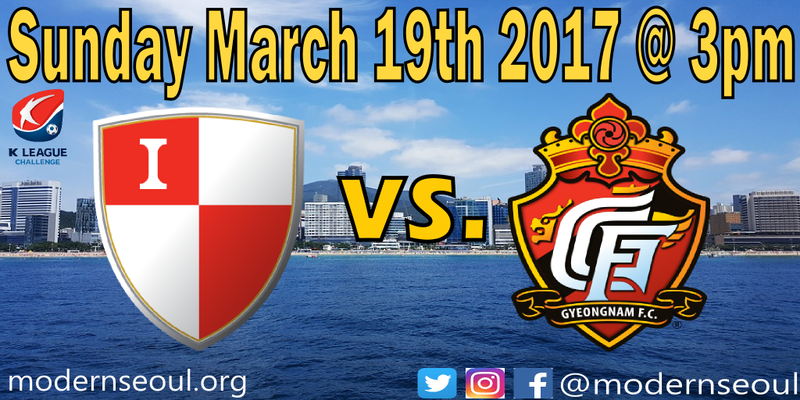 The highlight game of the day features 2 currently unbeaten and 100% record sides, Busan I’Park and Gyeongnam. Busan have beaten Seongnam and Ansan, whilst Gyeongnam have wins over Asan and Seoul E-Land. We’re siding with a draw, as both of these sides have looked strong during the early stages of the 2017 season. Ansan and Asan move up into the playoff picture, whilst Bucheon and Anyang certainly have work to do. Busan and Gyeongnam lose ground on Suwon.